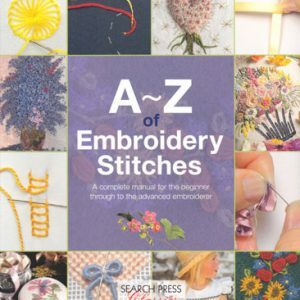 The A-Z of Embroidery Stitches book shows how to work an embroidery stitch through a series of photographs. The step-by-step photographs accompanied by easy instructions guide you from the beginning to the end of the stitch so you can actually see how the stitch should be worked. 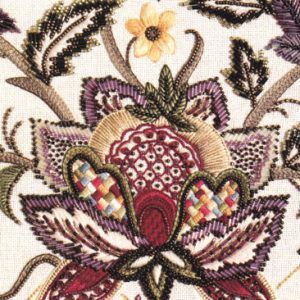 All basic embroidery stitches are featured in the book as well as some interesting flowers created in bullion knots and ribbon work. 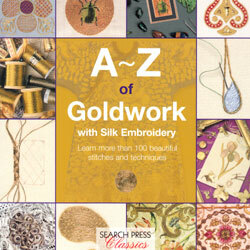 The A-Z of Goldwork book has step-by-step photograph guides for working with metal threads and a variety of projects ranging from beginners to advanced. 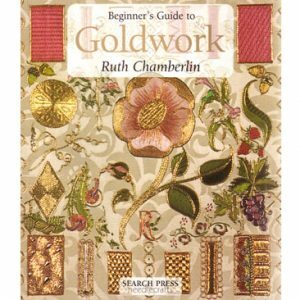 Thia is a great book for beginners to refer to when working embroidery kits and advanced embroiderers who would like to design their own goldwork pieces. My Goldwork Sampler Fleur De Lys Design and Plate Design are featured in the book. 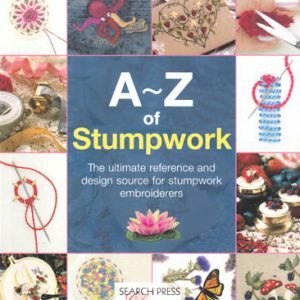 The A-Z of Stumpwork book is an informative book on stumpwork embroidery stitches with step-by-step photographs accompanied by easy instructions guide you from the beginning to the end of the stitch so you can see how the stitch should be worked. The book also has 20 beautiful stumpwork designs that you can stitch. 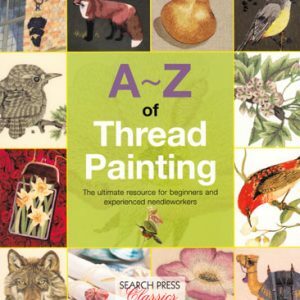 The A-Z of Thread Painting book has step-by-step photograph guides for working long and short stitch and other stitches used in thread painting (needle painting) and a variety of projects ranging from beginners to advanced. 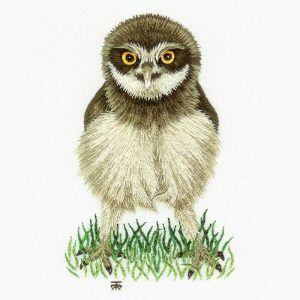 The book features my baby burrowing owl which is a beginners design, and my wolf, baby wren, spaniel and Siamese cat which are all advanced designs. The Beginners Guide to Mountmellick book is a project book with step by step photos of how to transfer the Mountmellick designs onto the fabric, how to work the Mountmellick embroidery stitches and how to knit the fringe often used around Mountmellick accessories. 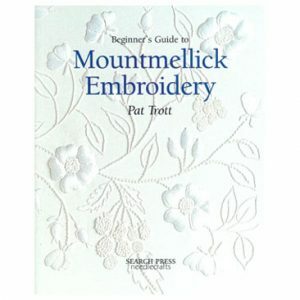 This is a great book to learn Mountmellick embroidery. 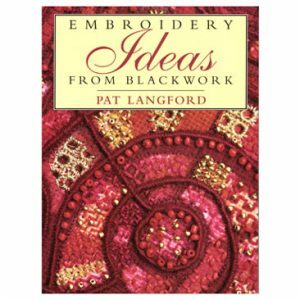 Embroidery Ideas from Blackwork book is a pictorial reference book for the embroidery designer for ideas on how to develop sketches into blackwork embroideries, incorporating colour, beads, applique of fabric and surface embroidery stitches. 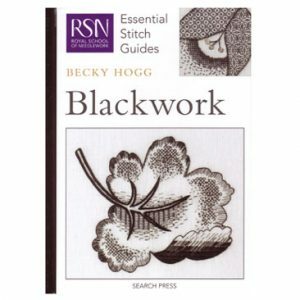 The RSN Essential Guide to Blackwork book is a good stitch guide and pattern book for blackwork patterns. 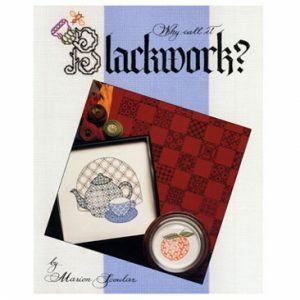 The book shows how to develop many different patterns from basic blackwork stitches, using detailed instructions and beautiful examples of traditional and contemporary embroideries. Blackwork – Why Call It? Why Call it Blackwork? book is my favourite blackwork book for choosing designs for my blackwork projects. Marion gives excellent tips and instructions for design inspiration, choice of patterns, shading, how to transfer a design and 14 pages of Blackwork patterns with about 18 designs on each page. It is a very valuable book if you are inspired to create your own designs. 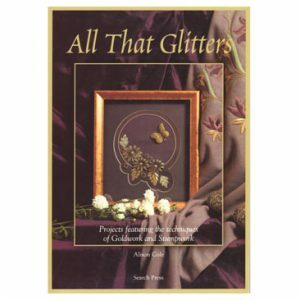 The All That Glitters book has many great tips on goldwork embroidery and beautiful projects to work. The book has large clear colour pictures of the projects that you can work with descriptions and photos on how to lay the metal threads. Many of the projects incorporate coloured silk threads, glass beads and stumpwork. 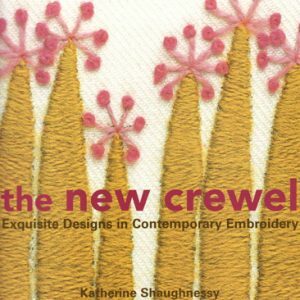 This book is an inspiration for all levels of embroiderers. This Beginners Guide to Goldwork book is a good reference book for goldwork techniques. The techniques illustrated in the book are on how to prepare the fabric for goldwork and the techniques worked on the sampler that is featured on the front page of the book. 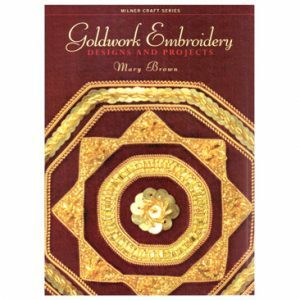 This Goldwork Embroidery book has a section on the history of goldwork with colour photos. 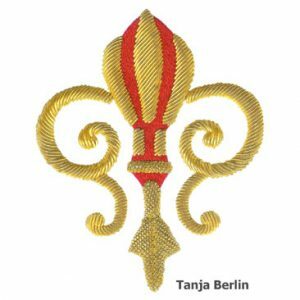 Descriptions of different types of metal threads and photos on how they are sewn down and 15 original goldwork projects. This is a good reference and project book. I carry the metal threads required to work the projects in the book. 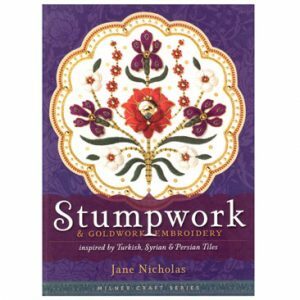 The Stumpwork and Goldwork Embroidery book has 16 projects combining silk embroidery threads, some in flat stitching and some raised/stumpwork and goldwork embroidery to produce beautiful motifs inspired by Turkish, Syrian and Persian tiles. This book is a joy to peruse and has fun colourful projects to work to brighten up your life. I carry the metal threads required to work the projects in the book. 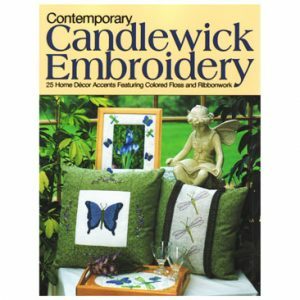 The Contemporary Candlewick Embroidery book has designs that use colored embroidery floss, silk ribbon, embroidery stitches and French knots. Simple enough for the beginner with full size patterns and step by step instructions. 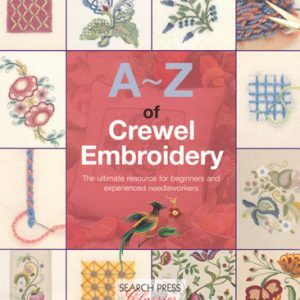 The New Crewel book is a really fun book on crewel embroidery. This book is great for all levels of stitches to make some fun small embroideries, great as small pictures and cushions for around the house and are quick and easy to stitch. 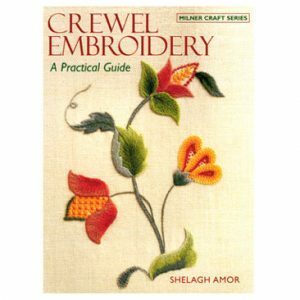 I can provide linen twill fabric to work the crewel work designs on. 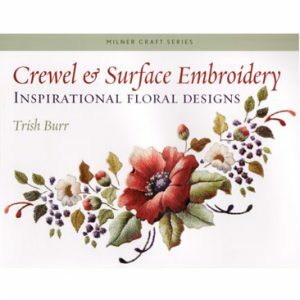 The Crewel & Surface Embroidery Inspiration Floral Designs book has a lovely selection of stylized floral bouquets designs to be worked in surface embroidery stitches. The designs are suitable to be worked in crewel wool, embroidery floss or silk threads. 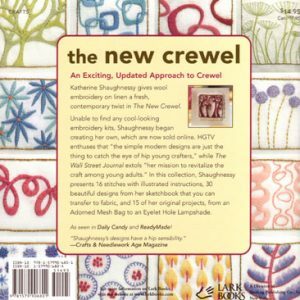 The Crewel Embroidery a Practical Guide book has a range of crewel work projects that can be worked with instructions and beautiful large colour photos of the finished pieces. At the back of the book there are colour diagrams of the stitches used. I can provide linen twill fabric to work the crewel work designs on. 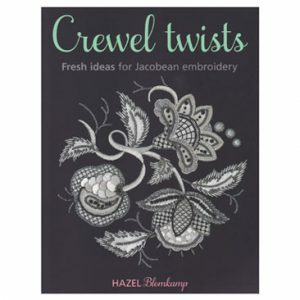 The Crewel Twists Fresh Ideas for Jacobean Embroidery book has some lovely Jacobean designs that incorporate beads and metal threads to add sparkle and texture to the embroidery. The book has stitch instructions as well as projects. 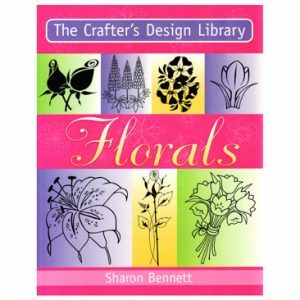 The Crafter’s Design Library – Florals book has line drawing designs of simple flower motifs to floral bouquets that can be used for hand embroidery such as blackwork and many types of surface embroidery. 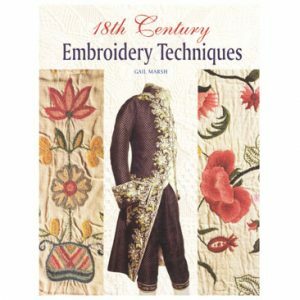 18th Century Embroidery Techniques book is an exquisite book brimming with information on the stitches, ornate embellishments and striking designs that were characteristic of 18th-century embroidery. It features beautiful illustrations and colour photographs of a wonderful array of museum-held 18th-century costume pieces and, with quotes and extracts taken from 18th-century journals and articles, provides a fascinating insight into the importance that was placed on suitable attire. 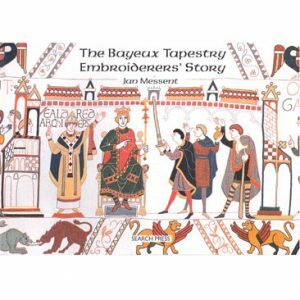 The Bayeux Tapestry Embroiderers’ Story book tells the story of how the tapestry was made. Chapters cover the designer of the tapestry, the embroiderers, the technique, problems and the borders. Each chapter is accompanied by many hand drawn colour pictures. This is not a book showing pictures of the tapestry but a book exploring the tapestry’s journey. 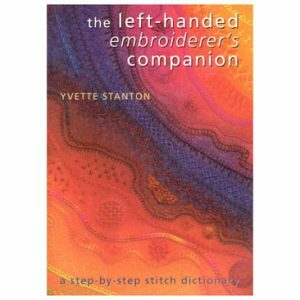 The Left-Handed Embroiderer’s Companion book is a must have stitch-guide book for left-handed embroiderers. The book has beautiful clear colour diagrams of over 170 different hand embroidery stitches for the left-hander. Work traditional surface embroidery stitches, needle point and counted thread stitches in a step-by-step format. Discover how to learn and master new stitches when the instructions are written specifically for the left handed stitcher. 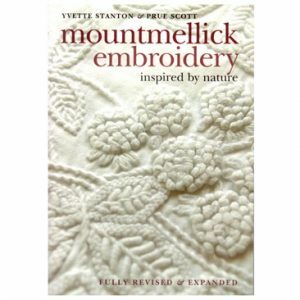 The Mountmellick Embroidery Inspired by Nature book is my choice book for Mountmellick embroidery. 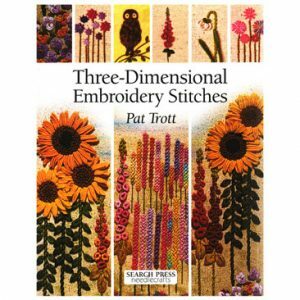 This is a great book for learning Mountmellick embroidery stitches, knitted fringes and there are 15 beautiful projects ranging from beginners to intermediate to advanced level. 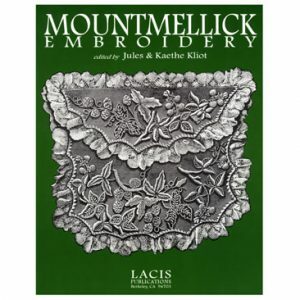 The book also has an interesting history section on Mountmellick Embroidery. 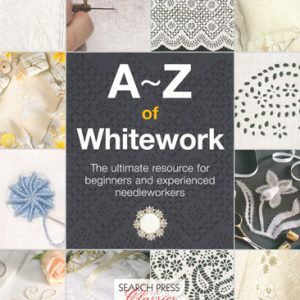 This book is a great accompaniment for my Mountmellick corner design kit and I can provide the Mountmellick fabric threads to work the projects shown in the book. The Mountmellick Embroidery book illustrates many examples of Mountmellick designs and the stitches used. Each illustration has a description of how the piece was worked, detailing the stitches used and the location of the stitches on the piece. I can provide the Mountmellick fabric and Mountmellick threads to work the projects shown in the book. 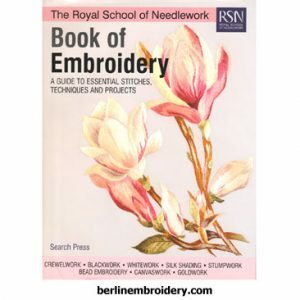 The Long and Short Stitch Embroidery book has a nice collection of flowers to embroider in the needle painting technique. 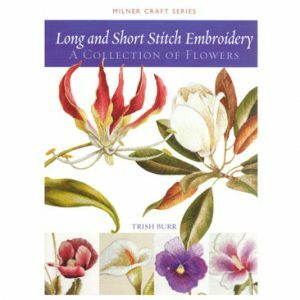 The book does not have diagrams on how to stitch each petal and leaf of the flowers like you will get when you purchase one of my needle painting kits but it is a good book if you have worked a few of my designs and are now familiar with the technique and would like some more flower designs to stitch. 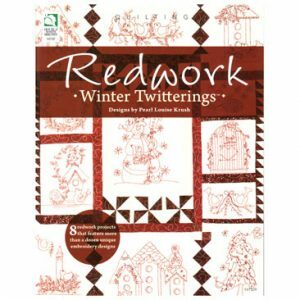 The Redwork Winter Twitterings book has eight projects to work in stem stitch, back stitch and French knots. Designs include a snowman, Christmas tree, doves, bird houses and candle with birds. The designs make a great compliment for quilts or can be worked individually for greeting cards, tea towels, pillow cases and pictures. Fun and easy to do and great for beginners. 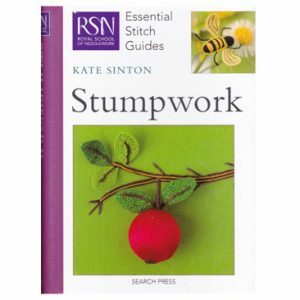 The Royal School of Needlework Essential Guide to Stumpwork book shows you how to develop beautiful stumpwork embroideries using traditional stitches and techniques. The book covers a short history, framing up, design, transferring the design, lots of work-in-progress photo pictures of working stumpwork stitches, padding and needle lace. This is a great stitch guide book. 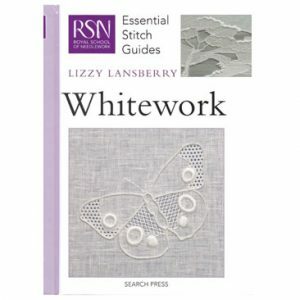 The RSN Essential Guide to Whitework book covers a short history, framing up, design, transferring the design, and step by step photographs on how to work stitches in pulled thread work, satin stitch, trailing, long and short stitch, decorative stitches, eyelets, drawn thread and cutwork. The Three Dimensional Embroidery Stitches book is a step-by-step guide to creating beautiful original embroideries using an exciting selection of raised stitches with textured effects. Contains 17 Stitches some of which are: Palestrina Knot Stitch, Portuguese Knotted Stem Stitch, French Knots, Tuftin, Woven Picot, Raised Cup Stitch, Whipped Spider’s Web, Woven Rose, Raised Leaf, Velvet Stitch and more. Explores different ways of combining stitches and colours. 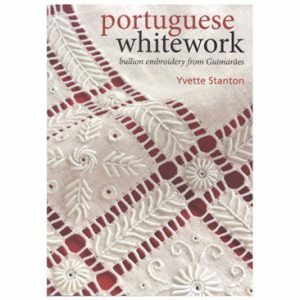 The Portuguese Whitework book is a fabulous book on an unusual technique. Portuguese whitework is worked on 38 count linen with No. 8 Perle Cotton and it incorporates drawn/overcast bars, eyelets and surface embroidery stitches such as bullions, stem stitch and padded satin stitch. The book contains easy-to-follow step-by-step stitch instructions and some beautiful projects. There are small projects such as hanging ornaments to big projects such as table clothes.